Wisconsin looks to advance both their men’s and women’s teams for a chance to compete once more on their home course, while the Michigan women will try to continue their strong 2018 and safely qualify out of Friday's Great Lakes Regional. Outside of the West and the Mountain, the Great Lakes is likely to send the most teams to the NCAA Championships, led by podium contenders from the Wisconsin men and Michigan women's teams. In the women's race, the five teams that will end up on top in Terre Haute seems pretty straightforward. But in the men's race, there's much more uncertainty. Here's a closer look at both races. Wisconsin will race outside of Madison for only their second time of the season. Their first trip away at the Big Ten Championships went swimmingly with three in the top four for a dominant victory. McDonald and Hoare comprise a 1-2 that nobody in this region can match and their remaining scoring runners should keep them comfortably in qualifying position. The Badgers' third runner at the Nuttycombe Invitational, Olin Hacker, was Wisconsin’s fifth man in 19th despite being sick. Though they will be fine in the regional even if he isn't at 100%, Hacker is a key piece of any podium plans the team has for the NCAA Championships. After Wisconsin, Notre Dame is in a strong position to advance. They placed fifth in their race at Pre-Nationals (ahead of Purdue and Indiana) and won the ACC Championships by four points over Syracuse. Yared Nuguse has led the team in the last three races. Even if Purdue places third, they look poised for an at-large berth. The team has four solid wins over likely qualifiers (all from the Nuttycombe Invitational), and the edge in tiebreakers on several others. 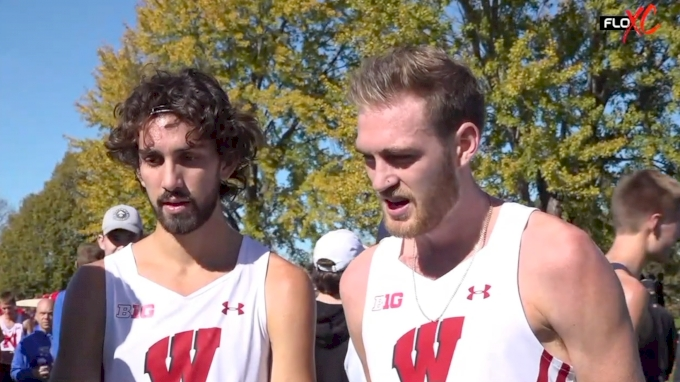 This won’t help them if they tumble too far down in the region, but the team has been crazy-consistent this year—they ran second to Wisconsin at Big Tens and took seventh at Pre-Nats and ninth at Nuttycombe, which are good results against deep fields. Beyond those three teams, several squads are firmly on the bubble. In the most recent Kolas projections, Michigan was the 31st (and final) team in the meet. Just behind them is in-state rival Michigan State as well as Indiana. Michigan owns five wins against projected qualifiers, while Michigan State has three and Indiana has six. Those three teams aren’t just close in the abstract. At Big Tens, Indiana finished one point ahead of Michigan and three points ahead of Michigan State. Depending on what happens in the rest of the nation, it’s possible that all three teams advance, but none of those squads will want to leave anything to chance. Many of the best teams in the Big Ten are channeled into the Great Lakes region, making it one of the deepest in the nation. Conference rivals Michigan, Michigan State, Wisconsin and Indiana will run back their meeting from the Big Ten Championships. There, Michigan prevailed using a balanced squad that isn’t overly reliant on one runner. Avery Evenson led the team in third place, but the revelation of the meet for the Wolverines might have been Anne Forsyth. The freshman placed eighth in her first race in a Michigan jersey. Forsyth is another piece in an interchangeable group that is well-suited for this time of the year when a small 1-5 gap is integral to team success. Michigan State finished 18 points behind Michigan and is a safe bet to slot in at the second automatic qualifying spot. Wisconsin (9 projected wins) and Indiana (12 projected wins) have the highest win totals on the Kolas forecast. Those numbers make them both overwhelming favorites to get an at-large bid if they don’t have a top-two finish. They are also helped by their reliable runners up front--for Wisconsin, that’s Alicia Monson and for Indiana, it’s Katherine Receveur. Monson hasn't lost a race where she’s gone full-effort this season, winning Nuttycombe and Big Tens (she ran with her team as a workout at Pre-Nationals). Receveur finished behind her teammate Margaret Allen at Nuttycombe, but has run better of late. She was sixth at Big Tens, but was just 1.5 seconds out of third place. Notre Dame is also expected to qualify out of the region (and break up the Big Ten party). They don’t have as many wins as Indiana or Wisconsin, but they have a strong, proven team led by Anna Rohrer and Jacqueline Gaughan. Their early season wins over Furman and Syracuse should also prove to be helpful. Past those five teams, it’s hard to see another qualifier out of the Great Lakes. There isn’t another team from this region in the top 40 of Kolas projections.